The use of geospatial technologies, particularly GPS enabled devices and simple Geographic Information Systems, has the potential to increase student engagement and achievement in Geography. Despite this, it is currently unclear whether teachers possess the knowledge required to effectively use the technology in their classroom practice. 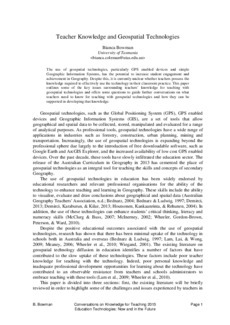 This paper outlines some of the key issues surrounding teachers’ knowledge for teaching with geospatial technologies and offers some questions to guide further conversations on what teachers need to know for teaching with geospatial technologies and how they can be supported in developing that knowledge.